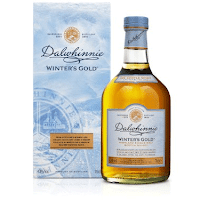 Diageo will present a new Dalwhinnie in September. Of course “flavour” is the key word for their new single malt. Scotland’s coldest and highest distillery plans to use their location as a unique selling point. The result will be a whisky without an age statement that is only distilled in the coldest months of the year. The reasoning behind goes as follows: The lower the temperature, the quicker alcohol vapours will rise and the less contact the spirit will have with the copper pipes. The result should be a sulphury new make eventually evolving into a rich honey and heather notes. The spirit for Winter’s Gold is distilled between October and March. The whisky is a vatting of first-fill American oak, refill American oak and European oak. Diageo’s Global Ambassador Donald Colville suggests to serve the Winter’s Gold straight from the freezer. It will enhance the honey flavours and the syrupy mouth feel even more. As the whisky warms in your hand, more aromas from heather, a little peat and spices should rise from the glass. Forget everything you have learned about serving whisky at room temperature and make some room next to the grappa and limoncello in your freezer.